The SodaStream product is a nice convenient alternative to going out and purchasing your favourite sparkling water. It carbonates easily. It's not too expensive for the purpose of an on going system to produce sparkling beverages. I do not drink or recommend sugared pop. If I want a treat, I'll use juice to sweeten and play with creative flavours. We use it with fruit or cucumber slices to kick it up, or maybe some maple syrup, honey or other natural sweetener. "Its a good thing" as Martha would say, for those who are into sparkling. Not sure what health issues a steady diet of carbonated water would bring. Go ahead a get one if this is your thang...smiles. I had some time today to experiment with the two Truvia packet samples. My curiosity peaked upon doing some reading on whether or not there were any health issues with this product. Turns out I couldn't find any adverse information at this date. It looks sort of like sugar. Not as coarse. I made some unseasonal fudgesicles from some left over tofu, skim milk, pinto beans, Nativia cocoa powder, some dark Toblerone pieces, and then the two trivia packets. Similar recipe is found on my site www.thespicelady.ca. I followed the table on they Truvia site for the ratios. Truvia is apparently sweeter than sugar. As it turns out not as sweet. I typically use honey, maple syrup, molasses, or organic cane syrup sugar to sweeten healthful treats. In this case, I ended up adding some organic honey to bring it to the desired sweetness. The honey added flavour of which the Truvia packets sadly do not. I would for sure suggest this product as a natural alternative for those who need to use an artificial sweetener substitute. I personally prefer to use honey or maple syrup to sweeten my coffee or tea, albeit in moderation. Try it, you'll enjoy it. To use Truvia for baking would most likely require a try and taste test to determine the amount required. Not sure the effort is worth it for it's minimal benefit. How much sweetener does one need anyway? I'd go with the honey for now as it offers healthful benefits as well as yummy flavour when consumed. Hmmm... I opened the samples and thought they had a lovely aroma, subtle but nice. Immediately my mind went in gear to creative ways to use this product. The first idea was to incorporate the roasted garlic flavour into a seedy slaw. I put them into a nutritious creamy version along with toasted sunflower seeds. The result was that the flavour was lost and the texture of the crunch in the amount provided was lost too. Because the flavour was lost and the sample size was small, I put both the Roasted Maple and Sweet Cinnamon flavours into my steel cut oats, with walnuts and skim milk. Sorry to report the flavour was way too subtle to none and the crunch became a tad chewy. Did not float my boat. People have the option to purchase whole flax seed or even the ground version at bulk food stores. I prefer to grind my own product. I don't feel this product lends to that much more of a convenience, although I do appreciate the producer's efforts to supply a body soluble friendly version. As spices are a big part of my brand, I prefer to add freshly ground spice to my dishes and encourage my clients to do the same. The flavour intensifies and you always have fresh spice. It is for these reasons, I do see the point of the product, but I do not see the overall enhanced benefits of a commercial flaxseed with flavour in the marketplace. It is my belief that the bang for our buck is best spent purchasing flaxseed on deal and adding our own creative flavour profiles. This product is not worth the expense for the retail price. I fell the overall health benefits in terms of convenience is not worth the expense. I would only recommend this product, when my clients were opposed to grinding their own flax. I eat and use Manitoba Hemp Hearts on a regular basis. I put them mostly in yogurt and cereals. I've used them as an ingredient in cookies. I've have had them as part of a savoury crust for fish, like salmon. I think they are more about the texture and nutritional component than the taste. They don't taste much like anything. I think they are closer in flavour to sunflower seeds. But, they are very small so you need to eat at least a tablespoon to get any flavour. I am watching my calorie intake and with any seeds, I want to watch consumption of even the healthful fats. My goal is to lose some weight. I need to keep to my daily allowance of all fats including sources like avocado, nuts and seeds, as we all do. I advise my clients to measure their fats and seeds for the day, hemp hearts included. I love all nuts and seeds. It is for this reason I recommend this product to my clients and give a 5 star rating. Hemp seeds are a pleasant way to attain our Omega-3's. These "City Snacks" have the texture of "Popcorn Curls" of the late 60's...or was it early 70's? I loved the texture as a child. And I really enjoyed this freeze fried pear snack today. The texture of dried fruit is not a favourite of mine. I prefer the light puffy freeze dried variety. Other freeze dried fruit and vegetable products (Orchard Blend, Sensible Foods - retail for much more than $1.75), that I have tasted, sometimes have a somewhat unpleasant bitter after taste. Also, they are not as light and more densely textured. The City Snack is light sweet and satisfying as far as snacking goes. Not so much on the feeling of quantity. My issues with this snack include, a serving is consumed rather quickly, you don't feel satiated, like you've had a treat. The fibre content in the nutritional information is only 1 g. Which I think is par for the course of freeze dried products. In fact, the nutritional information is much less than eating a fresh pear. The fibre content for a fresh pear is around 5 g. The carbs are much higher in a fresh pear. The good news is that there are no additives and it's just pear. The removal of the moisture appears to take out some of the nutrient properties. I would love to sample the other fruit flavours. The chances of my purchasing and recommending this product is high. I really enjoyed the flavour and the crunchy melt in your mouth texture. I used the Catelli Fusilli in a dish with skim milk béchamel, low fat swiss cheese, rainbow Swiss chard, and shitake mushrooms. The fusilli was cooked first and then baked in the mixture, like a casserole. The Catelli Fusilli worked very well. Hard to taste the difference from standard boxed gluten free pasta. I have used the GoGo quinoa in the same dish. Not much difference in the two products except for the colour. GoGo being two colours and a bit more translucent tasting (not sure how to describe the texture). The Catelli gluten free pasta worked just as well as the standard wheat boxed pasta. The issue that I have with this Catelli gluten free pasta and some other boxed pasta is the fiber content. I always look for more than 3 g of fiber. I wish this was higher in finer as well as no white rice flour. I would also prefer a higher vitamin count as well. Not sure if it is possible to add back vitamins to this gluten free pasta in the production. The other elements I look for is organic. 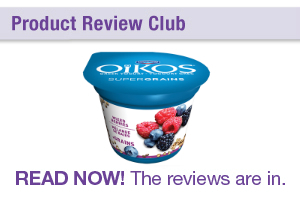 I would definitely recommend this product to my gluten free clients as an alternative. As for my family, and myself, If I don't make my own pasta, I prefer a high fiber product that is organic, totally whole grain, and GMO free. Thank you so much for the opportunity to use the Nutiva Chia Seeds. We know this is a healthful product. That’s a given. For me, it’s not about the taste as much as the texture of this product. It can be crunchy, pulpy, or silky. I have incorporated chia seeds in many baked goods. I use chia seeds in the place of poppy seeds. Using the chia seeds straight up in a bundt cake, results in the seeds staying very crunchy. If this is an issue, soaking them in the liquid, usually buttermilk, milk, yoghurt, or low fat sour cream, does the trick. Two cakes that I used to test the chia seeds are in a wonderful Austrian Chocolate (Poppy Seed) Cake and a bundt cake. The Austrian cake required grinding the seeds. For the bundt cake either leave them for really crunchy texture or soak them to incorporate them into the batter for a smoother taste. Once you eat the product, it can sometimes stay in your teeth, just like poppy seeds. It takes on a pulp like nature in your mouth. I teach international cooking. These seeds work well as a topping for falooda, a fragrant rose syrup enhanced ice cream noodle sundae. Traditionally basil seeds are soaked and used as a topping for this Middle Eastern ice cream treat. It kind of works like a tiny version of tapioca pearls. I have been eating these chia seeds with a bowl of yoghurt as a midday or evening snack or light lunch. The serving of yogurt is topped with a serving of fruit and a tablespoon chia seeds, a tablespoon of hemp seed and two tablespoons of sunflower seeds. I add a tablespoon of organic maple syrup if I crave a sweeter version. This dish is very satisfying and delicious, especially with the understanding that the health properties from Health Canada are conclusive and supported. Chia seeds rock! Having seen the segment on Dr. Oz about the health benefits of Red Palm Oil, I was curious but cautious in actually using it. I hit the net to read exactly how this red oil could work into a health conscious diet. I have found very little conclusive federally accepted data the supports the health benefit claim. The healthful fats I use in my recipe development generally but not wholly exclusive include: canola oil, organic extra virgin olive oil, grapeseed oil, sometimes coconut oil, and sesame and nut oils for drizzling and in baking products. To test this product, I took a tiny amount on a tasting spoon to get a feel for the taste. To me, it resembled a less funky ghee (Indian shelf stable clarified butter). The red palm oil did not really have any major taste to worry about or to love. I decided to give the product the benefit of the doubt and try it melted in the microwave over organic popcorn. To kick up the flavour, I sprinkled a generous dose of premium nutritional yeast. To my surprise, the colour was not significantly apparent. The taste was neutral. It helped the premium nutritional yeast adhere to the popcorn. The popcorn was delicious with a wonderful cheesy flavour. Not sure this affect would not be achieved using a small pad of melted butter or any of the oils listed above for that matter. The fact that this product imparts a red colour is not off putting to me. Being a creator of innovative recipes, this is a fun characteristic for me to explore and enjoy. I tried this product in stir fries. It’s very easy to use. In my opinion, the key to using fats in cooking is all about portion control. A couple of teaspoons to a tablespoon of red palm oil are enough to use in stir frying and curries. Again, I think the red colour is fun and attractive where appropriate. The issue on the fence for me is attaining bona fide data, from a credible source(s) that clearly and definitively states, “red palm oil, in these healthy quantities, is a wonderful organic, natural, healthy substitute for fat as part of a healthful daily diet.” I have read studies. 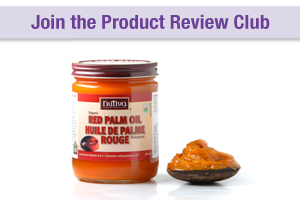 I just have not seen anything that supports the use of red palm oil from government agencies, Canadian or American Heart Associations or the like supporting claims. If there are such studies, please let me know where I can read them. If there were such data to support the claims, I would use it and recommend it to my students and clients. Having said that, it’s a conundrum true for coconut oil and the other tropical solid saturated fats. This appears to be an ongoing debate.